…So let’s just leave the context as a tiny back street in central Melbourne which is decorated in a range of interesting graffiti and art, not far from the prominent Flinders Street. I discovered it accidentally whilst trying to find a sweet looking spot for some coffee, and am now sat on a wonky stool on the pavement with my notebook out. Perfecto. Nosing at the graffiti it begins to stagger me how when it comes to street art like this, we seldom see it until it’s complete. Until it’s done. Finished. We are left wondering who imprinted these images upon these walls, and what thoughts were going through their minds when they decided that they wanted to put them here? What are the messages they were trying to get across to those passers by, and those who wanted to sit on the other side of the road drinking coffee? Just as I find myself starting to get a bit deep, I’m distracted by the overwhelming smell of cardamom. In this particular moment it comes across as an unmistakable sign of being abroad, much like how the skies over the CBD match the metallic greys of the skyscrapers which penetrate its landscape, yet the air remains so hot and humid. Typical Southern hemisphere city. The Hispanic cafe owner approaches my table and pierces the bubble of solitude that has encased me for the past hour whilst I’ve been lost in my notebook by serving up a warm pastry and explaining that it’s on the house. Time alone in a city comprises of a staggered sequence of the briefest of interactions, to the point where they become the subject of a closer focus. This was one of today’s more pleasant ones. Earlier on, whilst walking north along Swanston Street, a lady had tapped me on the shoulder to tell me that my dress was tucked up at the back. Mortified, all I could think to do was stutter out the fastest of thank you’s, avoid eye contact, and fixate madly upon a menu on display in the window of a nearby dim sum cafe in an attempt to hide my face and compose myself. Why do these things always happen when we’re alone! That said, I doubt anybody really noticed or cared anyway. That’s the mistake that we’re all guilty of making sometimes. We assume that we attract an audience whenever we slip up but the truth is that everybody’s probably too busy dealing with their own dramas to even have seen, let alone care. People are too busy thinking about what to have for dinner, or the wording they should use in a text message they’re apprehensive about sending. The older I become the more I understand that worrying about what others think is a bit like having a vaccination to protect you from contracting a disease. A shot of Hepatitis into our system will help our immune system to fight off a more prolific onslaught of the stuff, should we become infected. A small fragment of worrying about what people think helps us to become self-aware and identify the impact our actions can have on others, and that’s a very valuable thing, but if you worry too much, it can be pretty dangerous. As I think about this, the street art catches my eye again, and I find myself considering these mystery artists with even more respect than I did when I first set foot down this street and admired the talents on display. This recollection, over coffee, of the time I unknowingly flashed the people of Melbourne because my dress had caught onto my bag suddenly seems to be not too dissimilar to the time when these artists imprinted their hearts and souls onto a brick wall here in the city centre, on display for a thousand sets of eyes to cast judgment upon. In the act of expressing themselves, they knew that a lot of people would love their work. They also knew a lot of people would hate it and, most certainly, they knew that not everybody would understand it in the way it was intended. But, there the images are anyway, unable to conceal themselves in the window of a dim sum restaurant in the event of shame, unlike me. A lady with a big yellow umbrella leads a group of tourists around a corner and into the street. “And so this street is….” she begins to explain. I close my ears because I don’t want to hear. Sometimes it’s nice to just not know. It’s time to go and meet my friend at the station. …And the ominous dark grey skies that hang over the nation’s capital, Jakarta, as I sit alone inside a fast-food outlet at Arion Mall in the east of the city. Outside, the rain hammers down on traffic that will choke up the streets for hours to come, but the inevitable arrangement of horns thankfully cannot be heard from the refuge provided by this Mall. Instead, I am heckled by a quartet of teenage girls who marvel at the colour of my skin. Tourists don’t really come to these parts. I am here visiting friends who grew up in neighbourhoods not far from here, and if it weren’t for them, I doubt I would have come here either. The young girls ask me a series of questions and take it in turns to pose with me in a picture. Picture after picture. The forced smile slowly dwindling into complete lack of expression with each flash from the Blackberry. I have humoured this contact for a while, but now I really just want to be finishing the half-eaten plate of fried chicken that sits before me. The girls ask for my Instagram username and when I eventually return to a place with WiFi I’ll suddenly see that I have four new followers. They’ll upload the photos from our meeting and decorate the captions with #foreigner. Before I leave the Mall, I decide that it’s time to buy some Batik garments. I have always liked Batik, with its bright, bold colours and patterns. An assistant with a huge smile approaches me. He is wearing a waistcoat and looks like he could be about to break into song, maybe an Indonesian version of Agadoo or something. “Hello Miiiiss, can I help you?”. The assistant’s smile extends further and he begins to rifle through the collections passing me every damn item of Batik to try on. He’s a natural salesman. Having trialed each piece I eventually emerge from the changing rooms with the couple of dresses I have selected to go on and buy. The assistant eagerly waits by the door, enthused to hear about how I got on. He is pleased with the items I’ve chosen, but is also keen that I reconsider my decision not to buy a rather dreadful-looking black and red piece. Whilst watching him redundantly point out all of its merits another dress catches my eye, and it looks like the size on display would fit me perfectly. I go and take a further look. For a second I take offence though it’s hard to continue to do so when it’s clear that none was meant. What amuses me most is the way in which a steadily growing rapport could suddenly cease due to a moment of lingual naivety. I smile at my new friend – my new attentive stylist – as he goes on to initiate the payment process before we bid one another Selamat Tinggal forever. One of the best things about loving to write is that it’s an inexpensive hobby which can be undertaken anywhere at any time. Just stick me on a seat somewhere with a notebook and a pen in some place where I can inhale the situation around me and exhale script, and I’m a satisfied woman. This post is about my recent trip to Barcelona; and on this occasion I’ve strayed away from writing a general piece about the place. Rather, I’m going to describe a couple of moments from those jotted down in my notebook. I didn’t really know anything of Barcelona before visiting. Many people I know had had much more familiarity with the city, and had told me various interesting snippets about it, but for me the relationship between the capital of Catalonia and I had never been personal. Until I landed there a couple of weeks ago. With a train ticket for which I can claim ten individual journeys for 10 Euros, and with time on my hands, I look at a map of the Metro and select the most random name as somewhere to go to. ‘El Carmel’, to the North West of Linea 5, is my station of choice. To me, it just sounds a bit nobby. Like ‘caramel‘. I immediately envision a bunch of happy commuters heading to El Carmel for some molten toffee related joy. It won’t be anything like that, I know, but to me it looks out the way enough to host something that may be interesting. It takes a fair few attempts to get to El Carmel. Three, to be blunt. The curse of not understanding Spanish instruction mean that I go back on myself three times before reaching my destination. El Carmel is pretty nothingey to be honest, just a steep street of very little beyond a couple of quiet taverns that don’t seem to have had their exteriors refurbished since the 1980’s. But this is far from a wasted journey. For me, it’s just nice to get away from the tourists, especially your stereotypical group of loud Brits that you always encounter abroad – the ones who you so often overhear swearing about this, moaning about that, always expecting something for nothing and wondering why nobody understands them when they reel off complex English to natives. That’s one of the reasons I like to get off the beaten track; the other is that these random places – whilst not being aesthetically amazing – are the ones that feel more real. They serve as authentic vignettes into the lives of what it really means to be a resident of Barcelona. This is the cultural impression you won’t always find in the guidebooks, and it’s nice to take a moment to soak it up, even if I don’t stay long. At all. I’m not sure there’s a single word that may be able to define those sudden moments in which you feel at one with your surroundings… those fleeting experiences where you feel locked entirely in the present. It’s not necessarily about being anywhere special, it’s just about being somewhere at some time where the sensations around you hit you all at once. For me it’s on the Metro ride back from El Carmel: The sight of the lady opposite me with a kitten on her lap. The sound of the chirpy quintet of musical notes that inform us that we’re approaching the next station. A passing scent of marshmallows and shower gel. Other peoples’ legs brushing past mine as we travel during rush hour. Just the sensation of being somewhere different. “You stupid, clumsy idiot!” I think to myself as I sit at the cafe which neighbours the Metro station for the infamous parc Montjuic, home of the Olympic stadium and Palau Nacional amongst others. I’ve had to take an immediate pit-stop upon arrival after a carbonated drink leaked it’s entirety into my rucksack somewhere on the walk between here and Paral-lel station. The bag is soaked so I’m hoping to air it out a little first rather than continue carrying it around on my back. (Okay, I was a little more polite and less self-depreciating than that, but that’s what I wanted to write). But then, holidays aren’t for deploying brain cells, I guess, even though I do feel bad for inadvertently betraying hostel etiquette. Nevermind that, or anything else though. I suddenly become grateful for my leaking bag, because it’s prompted me to sit and take the time to take in a pretty awesome view of the city. An old guy who reminds me of a Spanish version of my late Uncle Ken has served me up a couple of the most delicious cafe con Leche and after an overcast morning the sun is lighting up Barcelona, and it’s time to explore. On the crest of a whimsical wave I decided to sign up to the free rooftop yoga session which was being offered by the hostel on a Friday evening. It had been 5 years since I’d last tried yoga back home in Canterbury, and though I’d struggled with the art back then, I deemed it worthy of a second chance, particularly out here in Spain. At 8:30pm a group of us assembled in the hostel foyer before a staff member reminiscent of Cher helped to bundle us into the elevator up to the ‘secret floor’ from which we could access the rooftop pavilion, an act which was usually forbidden. I picked up a yoga mat and placed it on one of the few remaining patches of floor. Somewhat typically, I had managed to find the only bit above which a leaking valve was intermittently dripping an oily, pungent liquid onto the floor (and later on, my arm). And so began an hour of stretches and breathing which I was grateful to have been able to try for free, but couldn’t really get into. For starters, half the classmates were a bunch of excruciatingly loud professionals on tour from the US, a couple of whom I was convinced I could hear mocking my choice of trousers at one point. The notion was compounded by spotting myself in the epicentre of what appeared to be a sneaky selfie as they took it. I cheered up by reminding myself that they were on a yoga holiday; and had traveled all this way just to basically stretch and breathe in a different setting. I just don’t get yoga. Well, that’s not quite true – I understand it – I just find it exceptionally boring. What’s more, for an exercise which oscillates round the key concepts of nature and mindfulness, there was something that just felt so inherently wrong about practicing it a mere couple of blocks away from the Passeig de Gracia, a big fat modern street that itself oscillates round the concept of commercialism and overpriced designer goods. as rowing boats drift in the sun. and tightropes between trees for fun. I’m going to avoid posting about the obvious this month. I’ve made my feelings known among various people over the past couple of days, and I’m sure that there’s going to be a lot more to say over the next few weeks, months, years, decades and centuries. The reality is that the implications of the decision that has been made have not even started yet, and I dare say that the magnitude of those implications is something that none of us will really know or understand until it’s all actually happening. Which is an incredibly scary thought. There are plenty of discussion points ahead but I’m not going to use this month’s post to essentially repeat everything I’ve been ranting about over the past 48 hours because quite frankly it will only wind me up even more, and wound up is not how I want to spend my Sunday. Instead, I wanted to post something more lighthearted that may hopefully detract me from scouring the internet in desperation to see if having Huguenot blood and a fondness for confit de canard can serve as a prerequisite for applying for a French passport. I am going to stick with a European theme though, and combine it with something that never fails to uplift and bring joy to my life – food. So herewith, in no particular order… a list of some of my favourite European foods experienced during holidays on the continent…Enjoy. Will you be giving any a go? Spätzle is a variety of noodle which derives from the Swabia region of southern Germany. Very popular in this and the alpine areas below, spätzle is a common accompaniment to any dish and with its soft, slightly chewy texture it’s easy to understand why. Spätzle is most commonly served with meat or in a nutty cheese sauce with ham. My favoured way of eating spätzle is with pork medallions and a creamy peppercorn sauce. Very tasty. This is a funny one because I wouldn’t necessarily call myself a gherkin enthusiast, but I absolutely love cornichons (which are basically just baby gherkins too classy for Big Macs). It was in France some years ago when I first noticed these miniature, green powerful pickles seem to accompany every dish I was served, and I liked them a lot more than I thought I would. Juicy and crunchy with a sharp sweetness, cornichons would make great and revered leaders in a society of fruit and veg. Of course Belgium’s contribution to this list would be chocolate-related, but I’ve chosen something quite specific on the basis that even in our global society, this is one thing I’ve not yet seen available in the UK : Pistachio fondant chocolate bars! Any trip to a supermarche abroad will necessitate looking out for these beauts, which are essentially just Fry’s Chocolate Creams in a slightly more interesting flavour. I could write essays proclaiming the values of the existence of French cheese, and it seems so harsh to select just one, but if I had to, then it would definitely be Comté. Not dissimilar to the much more renowned gruyère, for me comté just edges it in the Battle of the Cheeses. Nutty and creamy, this batch of mountainous delight permanently changed the way I think about jacket potatoes. “The Bicky Burger is a tasty deep fried burger (a mix between chicken, pork and horse meat) topped with three unique sauces (the yellow Bicky Dressing, the Red Bicky Ketchup and the brown Bicky Hot Sauce), crispy onions and pickles or cucumbers served between a sesame sprinkled bun”. Any visitor to Belgium must try the Bicky burger. Some of my favourite childhood memories are of being in a massive adventure playground in Belgium eating a Frikandel during family Summer holidays in the 1990’s. Best described as a ‘minced pork hot dog’, the Frikandel is deep fried and – unlike most other kinds of sausage – doesn’t have a skin. It’s very unique tasting and to date I’ve not been able to find anything similar in the UK, but I’ll keep looking! Spaghettieis is essentially just vanilla ice-cream with strawberry sauce, but it’s genius. 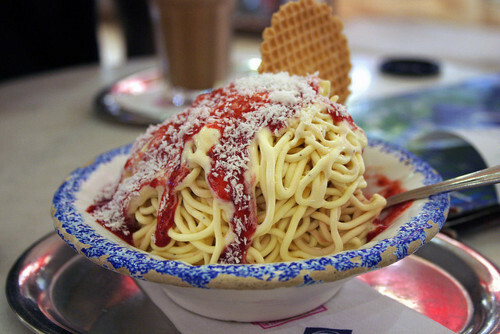 The ice-cream is pumped out through a noodle press giving it a spaghetti-like appearance on the plate. The strawberry sauce bears an uncanny resemblance to tomato sauce. The coconut flakes are reminiscent of grated cheese. It works and it’s amazing, and whoever came up with the idea easily makes my list of Most Influential People. Ever. This morning I booked a return flight back to Indonesia, for September. My ’30th birthday present to myself’, I really wanted to go somewhere special to mark a milestone birthday this year, and it was only ever going to be Indonesia. The country is my spiritual home, where the journey started five years ago, and every now and then when I feel that the spiritual vaccine I received back then may be beginning to wear off – filed away by the emery board of the largely superficial and impatient mainstream Western culture – I know that to go back for a booster jab would probably be wise. Indonesia, you and I have a lot to catch up on. I’m excited to spend some quality time in your Equatorial heat with some of my favourite natives of yours again, and almost just as importantly, to indulge in some of your finest snacks that we simply don’t have over here…. 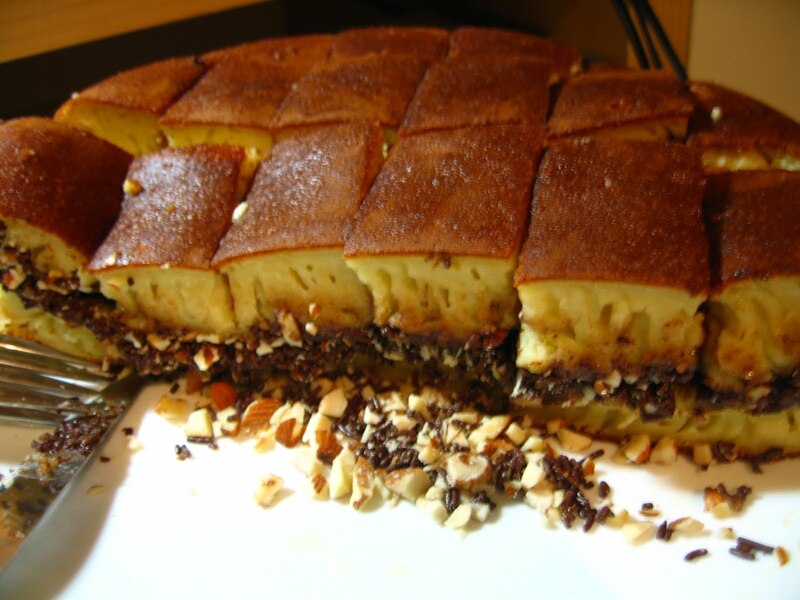 There’s also the pandan cake, a favourite at Indonesian birthday and wedding parties. It looks just like a regular sponge, and for the most part, it is. Except for the crucial difference that it’s BRIGHT GREEN. 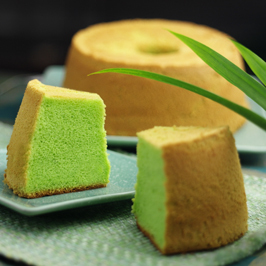 Made using the leaves of the pandan – a tropical plant popular in South Asia – pandan cake is similar in flavour to coconut, with a few hints of citrus as well. And because the cake is naturally green, it’s healthy right?! And these are just a few. I’m pretty sure that what with globalisation and all that jazz, any – if not all – of the items listed above will one day be available here in the UK, similar to how the likes of sushi, beef jerky and sweet-chilli dipping sauce have migrated in recent years to populate the aisles of M&S. 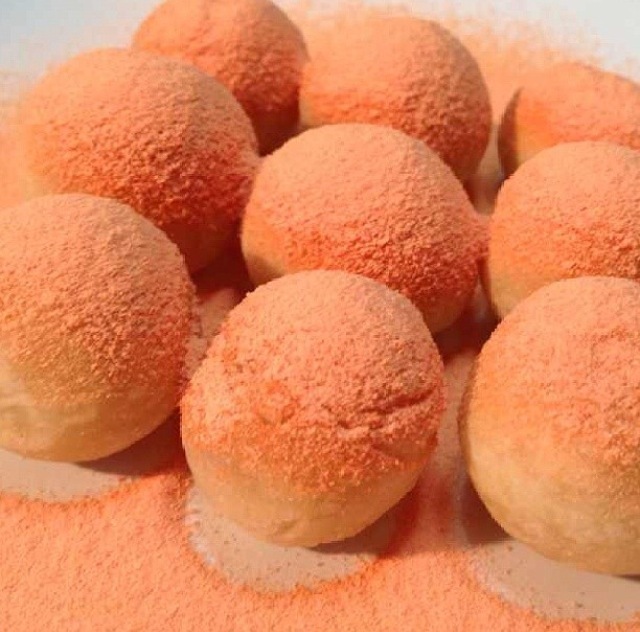 It’s a long way to go for a bit of cimol-cimol otherwise…. Reasons to love electro swing #4291. Happy and amusing music.